Gather and enjoy a fine dining experience next to the waves. From fresh, local seafood and regional classics to innovative creations, The Marine Room offers up new foods and flavors for every palate. The globally-inspired menu is seasonal, yet timeless in its approach, showcasing the coastal flavors of San Diego and La Jolla. Relax in the bar and lounge, serving up creative small plates, specialty drinks and spectacular high-tide views. 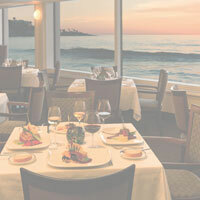 Experience an elegant La Jolla restaurant on one of the most beautiful beaches in Southern California. The Marine Room's dress code is business casual. Jackets and ties for men are not required but appropriate. Lounge Opens at 4 p.m. Dinner Seating begins at 6 p.m. Lounge Opens at 4 p.m.
*Please note that Happy Hour is not available on holidays or during special events. *Please note that Happy Hour is not available on holidays or during special events including Restaurant Week. *Lobster Night menu will not be available during holiday weekends, Restaurant Week, Christmas Eve, Christmas Day, or New Year's Eve. Sunday, May 12, from 11 a.m. to 7 p.m.
June 16, 2019 $82 per person / $45 children 6 to 10 years / 5 and under free 10:00 a.m. to 2:00 p.m. The view only gets better during high tide! Join us for our à la carte dinner menu and watch as the tide brings the waves up to our picture windows. Please make your reservation in advance to secure your table. Thursday, May 2 5.6 ft. 8:46 p.m.
Friday, May 3 5.9 ft. 9:10 p.m.
Saturday, May 4 6.1 ft. 9:27 p.m.
Sunday, May 5 6.2 ft. 10:06 p.m.
Tuesday, May 14 5.6 ft. 7:20 p.m.
Wednesday, May 15 6.1 ft. 7:54 p.m.
Thursday, May 16 6.5 ft. 8:28 p.m.
Friday, May 17 6.7 ft. 9:02 p.m.
Saturday, May 18 6.7 ft. 9:35 p.m.
Sunday, May 19 6.6 ft. 10:09 p.m.
Thursday, May 30 5.7 ft. 7:37 p.m.
Friday, May 31 6.1 ft. 8:05 p.m.
Saturday, June 1 6.4 ft. 8:35 p.m.
Sunday, June 2 6.6 ft. 9:08 p.m.
Monday, June 3 6.8 ft. 9:43 p.m.
Wednesday, June 12 6.0 ft. 6:46 p.m.
Thursday, June 13 6.4 ft. 7:25 p.m.
Friday, June 14 6.7 ft. 8:02 p.m.
Saturday, June 15 6.8 ft 8:38 p.m.
Sunday, June 16 6.7 ft 9:13 p.m.
Monday, June 17 6.6 ft 9:48 p.m.
Friday, June 28 5.9 ft 6:55 p.m.
Saturday, June 29 6.3 ft 7:31 p.m.
Sunday, June 30 6.7 ft 8:08 p.m.
Monday, July 1 7.0 ft 8:48 p.m.
Tuesday, July 2 7.2 ft 9:24 p.m.
Wednesday, July 3 7.2 ft 10:13 p.m.
Wednesday, July 10 5.8 ft 5:26 p.m.
Thursday, July 11 6.1 ft 6:16 p.m.
Friday, July 12 6.4 ft 7:01 p.m.
Saturday, July 13 6.5 ft 7:43 p.m.
Sunday, July 14 6.6 ft 8:22 p.m.
Monday, July 15 6.6 ft 8:59 p.m.
Tuesday, July 16 6.5 ft 9:34 p.m.
Wednesday, July 17 6.4 ft 10:08 p.m.
Saturday, July 27 5.9 ft 6:11 p.m.
Sunday, July 28 6.4 ft 7:04 p.m.
Monday, July 29 6.9 ft 7:49 p.m.
Tuesday, July 30 7.3 ft 8:34 p.m.
Wednesday, July 31 7.5 ft 9:19 p.m.
Thursday, August 1 7.4 ft 10:05 p.m.
Friday, August 9 5.9 ft 5:51 p.m.
Saturday, August 10 6.1 ft 6:45 p.m.
Sunday, August 11 6.2 ft 7:31 p.m.
Monday, August 12 6.4 ft 8:12 p.m.
Tuesday, August 13 6.4 ft 8:48 p.m.
Wednesday, August 14 6.4 ft 9:21 p.m.
Thursday, August 15 6.3 ft 9:53 p.m.
Sunday, August 25 5.7 ft 5:47 p.m.
Monday, August 26 6.3 ft 6:44 p.m.
Tuesday, August 27 6.8 ft 7:34 p.m.
Wednesday, August 28 7.2 ft 8:22 p.m.
Thursday, August 29 7.4 ft 9:09 p..m.
Friday, August 30 7.2 ft 9:55 p.m.
Sunday, September 8 5.6 ft 6:30 p.m.
Monday, September 9 5.8 ft 7:19 p.m.
Tuesday, September 10 6.0 ft 7:58 p.m.
Wednesday, September 11 6.1 ft 8:33 p.m.
Thursday, September 12 6.1 ft 9:05 p.m.
Friday, September 13 6.0 ft 9:35 p.m.
Saturday, September 14 5.8 ft 10:06 p.m.
Tuesday, September 24 6.0 ft 6:27 p.m.
Wednesday, September 25 6.5 ft 7:21 p.m.
Thursday, September 26 6.8 ft 8:10 p.m.
Friday, September 27 6.8 ft 8:58 p.m.
Saturday, September 28 6.6 ft 9:45 p.m.
Sunday, September 29 6.1 ft 10:33 p.m.
Includes welcome cocktail, cooking demonstration, three-course dinner and wine pairing. *Please call 858.459.7222 to reserve your seat for Cooking Class.